Only one gold coin design in the history of the United States Mint has been struck as an incuse element. The Indian Head logo created in 1907 for the quarter-eagle and half-eagle coin in the US gold coin circulation collection was designed by Bela Lyon Pratt and struck onto the gold coins with an incuse set. The Pre-33 $5 Gold Indian Head Half Eagle Coin is now available to you for purchase online at Silver.com with a Mint State certification. Ships to you inside of a protective plastic slab! Available to the American public from 1908 to 1929! Consists of .2419 Troy ounces of actual gold content. Bears a Grade of Mint State 61. Obverse includes the Indian Head design in left-profile relief. Reverse depicts the bald eagle as it stands perched with wings closed. Struck by four different US Mints in its coining history. The Pre-33 US gold coins, such as the Gold Indian Head Half Eagle, were produced by the United States Mint starting in 1794. Through the history of the series, the bulk of the coins featured one of three different designs. The Turban Head depiction of Lady Liberty was the first and was in use through the 1830s, replaced at the time by Christian Gobrecht’s Liberty Coronet design. In 1907, the United States Mint set out to replace the Liberty Coronet design, but only on the Gold Half Eagle and down in denomination. The Gold Eagle and Gold Double Eagle received Augustus Saint-Gaudens’ iconic depiction of Liberty, while the Quarter Eagle and Half Eagle were struck with an incuse Indian Head. The use of an incuse striking is unique to those two denominations, and features the image sunken into the surface of the coin. On the obverse of the Pre-33 $5 Gold Indian Head Half Eagle coin is the left-profile portrait of a Native American in left-profile relief wearing a full headdress. There are 13 stars around the figure, with six to one side and seven on the other. “Liberty” is engraved above, while the coin’s unique year of issue is featured below. The reverse side of the Gold Indian Half Eagle coin features the American bald eagle. Rather than in flight as many other coins would depict the bird, this eagle is at rest. It sits perched atop a collection of arrows which are wrapped in an olive branch. The coin’s face value, nation of issue, and a national motto are engraved on this face. 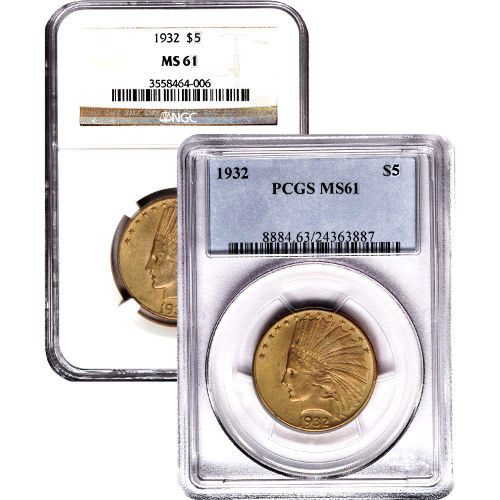 Pre-33 $5 Gold Indian Head Half Eagle Coins were produced by the United States Mint at three of its current facilities and one that is now defunct. The Denver Mint, Philadelphia Mint, and San Francisco Mint struck the coins, as did the New Orleans Mint. We encourage Silver.com customers to contact us with questions at 888-989-7223. You can also chat with us live online or send us an email with your inquiries.